The European Space Agency has created a website where people can offer their suggestions to name the ExoMars 2020 rover. Astronaut Tim Peake is leading the hunt for a great moniker. He wants everyone to go to a special website set up for the purpose and enter a suggestion. But don’t think “Spacey McSpaceFace” is a goer because this is not an online poll. All ideas will be put before an expert panel and it is they who will make the final choice. If all goes right, 2020 should see two new rovers arrive on the Martian surface. The June release of new images from Mars Reconnaissance Orbiter (MRO) included three images of the two candidate landing sites for Europe’s 2020 ExoMars rover mission. All three images provide us as hint at what that rover might see when it arrives a few years from now. 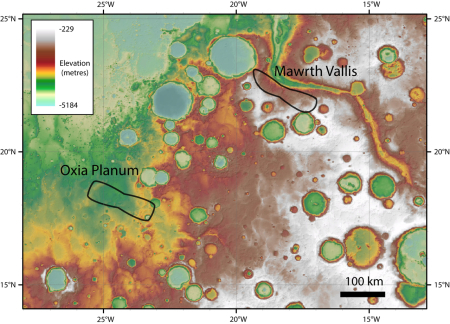 The two candidate sites are locations on Mars dubbed Mawrth Vallis and Oxia Palas. The map to the right shows their general location to the east of Mars’s giant volcanoes and giant canyon Valles Marineris. The red splotches indicate the large number of images taken by MRO of these locations, partly to help the ExoMars science team choose which site to pick and partly to study the geology in these Martian locations. As you can see, both candidate sites are in the transition zone between the northern low plains and the southern highlands. At first glance Mawrth Vallis seems the more spectacular site. Mawrth (Welsh for Mars) is one of the gigantic drainage canyons near Valles Marineris. Though tiny in comparison to Valles Marineris, on Earth it would easily rival the Grand Canyon in size, and in fact is slightly longer (400 miles versus 300 miles). Unlike the Grand Canyon, however, Mawrth Vallis doesn’t appear to have a distinct or obvious rim. This video, produced by the European Space Agency using images from its Mars Express orbiter, gives a sense of the canyon’s terrain as it flies upstream from the northern lowlands to the canyon’s high point in the southern highlands. The highlands on either side of the canyon more resemble the broken geology of Mars’s chaos regions that are found scattered about in this transition zone than the flat generally level Kaibab plateau that surrounds the Grand Canyon. The clay-rich terrain surrounding Mawrth Vallis is one of the most scenic regions of Mars, a future interplanetary park. …The origin of these altered layers is the subject of continued debates, perhaps to be resolved by a future rover on the surface. We do know that these layers are very ancient, dating back to a time when the environment of Mars was wetter and more habitable, if there were any inhabitants. Other MRO images of Mawrth Vallis here and here emphasize this description. 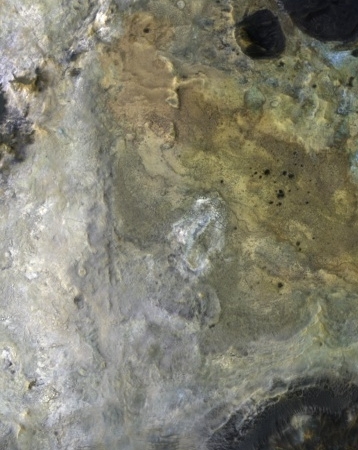 As for Oxia Palas, the other candidate landing site for ExoMars 2020, in the June MRO image release there were two images. The new colonial movement: In a documentary released this week Russian President Vladimir Putin pledged that his country will send an unmanned mission to Mars in 2019, and that it will be aimed at studying water at the red planet’s poles. This is funny. Putin is likely referring to ExoMars 2020, which Russia is partnering with the European Space Agency (ESA). In that mission, Russia is providing the rocket and the descent and landing technology for ESA’s rover. To claim that this is a Russian mission is a bit of an over-statement, since the only Mars-related equipment Russia is building involves the landing, and the ESA is also participating in that work. Nonetheless, Putin’s words here illustrate how the competition is heating up. Every nation wants its share of the exploration of the solar system, and they are beginning to ramp up their efforts to make that happen. On Friday the European Space Agency signed a contract with Thales Alenia Space for the construction of the European portion of the ExoMars 2020 lander/rover mission. The contract signed in Rome, Italy, secures the completion of the European elements and the rigorous tests to prove they are ready for launch. These include the rover itself, which will be accommodated within the Russian descent module, along with the carrier module for cruise and delivery to Mars. ESA is also contributing important elements of the descent module, such as the parachute, radar, inertial measurement unit, UHF radio elements, and the onboard computer and software. The science instruments for the rover and surface platform are funded by national agencies of ESA member states, Roscosmos and NASA following calls to the scientific community. I had missed this last week. The Thales Alenia press release has more information. I wish them luck, especially the Russians, whose luck with missions to Mars has been truly terrible. I suspect that the Russians will use some variation of their bouncing balloon technology for the lander, which worked on their 1960s lunar rover missions and was successfully copied by NASA for its 1997 Pathfinder/Sojourner rover mission. Despite the failure of the Schiaparelli lander on ExoMars 2016, the European Space Agency today approved funds to build and fly the ExoMars 2020 rover mission. At a meeting of European government ministers in Lucerne, Switzerland, on 1 and 2 December, ESA member states agreed to provide an extra €339 million for ExoMars 2020. ESA also announced that it will find a further €97 million by moving funds internally. Speaking at a press briefing after the meeting, ESA director-general Jan Wörner said this would be done “without detriment” to ESA’s wider science budget. But not all projects were so fortunate. Member states did not commit the €250 million needed to fund a plan for ESA to participate in a mission to deflect the moon of an asteroid, although they left door open to future, similar projects. I am not at present sure how they are going to divide up the work between Europe and Russia. Earlier it was my understanding that Russia would provide the roving technology, but right now I am very unsure about this. One side note: At this same meeting ESA committed to sticking with ISS through 2024.